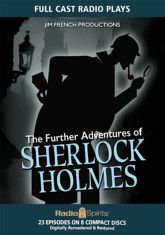 The name of Sherlock Holmes conjures images of gas-lit streets and dark mysteries from a bygone age. Solving crimes alongside his trusted friend Dr. John H. Watson, Holmes is without a doubt the most famous sleuth the world has ever known. For more than 100 years, he has been the subject of countless literary works, stage plays, films, television shows, and radio programs. Now, with full authorization from the Conan Doyle estate, we bring you 23 newly written adventures as presented on the long-running dramatic radio series starring John Patrick Lowrie as Holmes, with Lawrence Albert as Dr. Watson, Rick May as Inspector Lestrade, and Mary Anne Dorward as Mary Watson. Jim French Productions produced over 800 full cast radio shows from 1975 through 2017, including such favorites as Harry Nile and The Classic Adventures of Sherlock Holmes, which were broadcast on radio in the United States under the Imagination Theatre banner. Originating on KVI AM radio, and later KIRO AM and KIXI AM radio, Imagination Theatre was nationally syndicated to an additional 120 broadcast outlets. Jim French programs can be heard nationally on SiriusXM RadioClassics (Channel 148).